EMSWCD will make land, equipment, infrastructure, and some services available to incubator farmers. The rental cost and time payment is due will vary for each item. Below is a list of the pricing for the 2016 growing season, and the payment schedule. 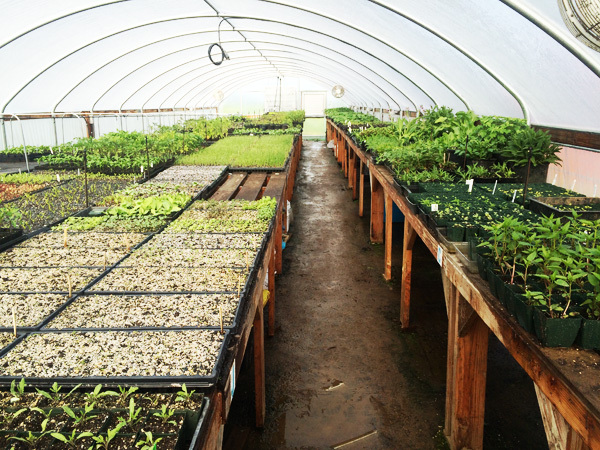 Many of the items to rent are optional and their usage is determined by the farm operation and the resources incubator farmers already have available. Recoup the cost of the items prior to exhausting their usefulness. Reasonable prices for items with To Be Determined (TBD) notation will be set in the near future to meet these objectives. Land will be leased in 2017 at $600/acre/year. This will include a number of amenities (see 2015 Fee Breakdown and Payment Schedule Table for a complete list). Land costs will incrementally increase each year a participant is in the program. The first year a participant is in the program, land rent will be charged at a quarter of market value (i.e., 25% of $600/acre/year, or $150/acre/year) and increase an additional 25% each season. By the fourth—and final—year of the program incubator farmers will be paying market value for their land. The backpack sprayer will be primarily for foliaring starts and crops, however, it may be available for certain OMRI-listed pesticide applications. Those will need to be cleared with Farm Incubator Manager prior to usage with this piece of equipment. A basic training of the tool will be needed before farmer usage. This is a basic single wand flame tool for pre-emergent weeding. Farmers must be trained on the tool prior to operation. The BCS 749 is a 13hp, diesel engine with a 30-inch tiller. Fuel is included in the rental cost. Farmers much go through a basic training before they are cleared to use the machine. Irrigation — .50 cents/sprinkler-hour (for overhead watering only); water for drip irrigation is free! The irrigation system is configured to accommodate both drip irrigation and overhead watering. It is the goal of EMSWCD to promote and encourage the use of conservation practices, which is why water for drip irrigation will be provided for free if incubator farmers purchase their own drip system. Access to a basic station to wash and process produce will be included in the cost of land. However, it is critical that incubator farmers keep the facility clean and coordinate their harvest schedule with other participants. Approximately a pallet-sized space with eight-vertical feet can be rented on a monthly basis. This includes table space for trays and other plants, in addition to areas where soil mixes and seeding trays can be stored. This germination chamber is set up in the propagation house. Farmers will be responsible for ensuring that temperatures don’t get too high on hot days. It is recommended that individuals sharing the germination chamber work cooperatively to manage temperature and soil moisture. Current storage space is in a cargo container near the fields. Storage space options may change once the barn is built. All participants will have access to the onsite office to use as a restroom, basic kitchen, and to work on paperwork or other farm-related items. Internet is available in the office, as is moderate electrical access. Spring tillage will be included in the cost of land assuming the area to be disced in is over a quarter-acre. HIP farmers in their second year or beyond will have the opportunity to become certified tractor operators, and then rent the New Holland to utilize in their field.